Adding decorative door casings is one of the easiest ways to create architectural interest in any room in your home. In fact, it’s an easy do-it-yourself project that just about any homeowner can complete in a weekend. But with all the choices out there, how do you choose the best style for your home? 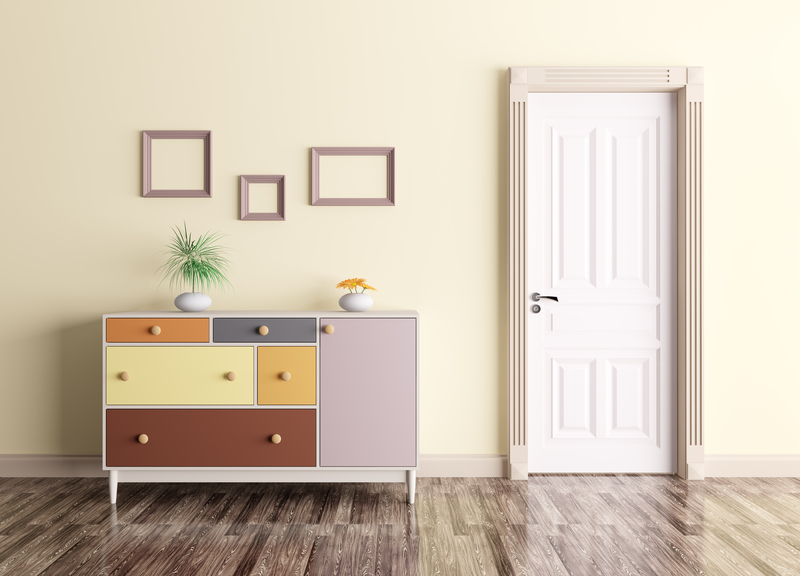 Read on for a quick primer on door casings, along with helpful tips to get you started. What Is Interior Door Casing? Basic doorway casings are made up of just three separate pieces – two long trim pieces on either side of the door frame topped with a shorter piece (the head casing) to complete the frame. Historically, door casings have set the tone for a room. Victorian-era designs from the late 19th century used fluted boards butted against decorative corner blocks (rosettes). These designs were symmetrical and used a uniform pattern across their faces. 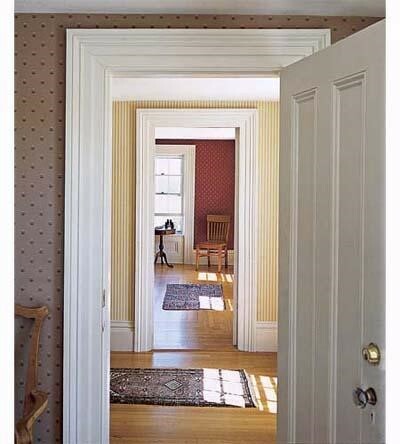 Tapered casings, created by building up several profiles from the inside of the door jamb to the outer edge, were common in 19th century Federal and Italianate homes, and later in Greek Revival and Colonial styles that prized depth and dimension. Today, door casings come in a wide variety of styles from clean and simple to ornate and elegant. 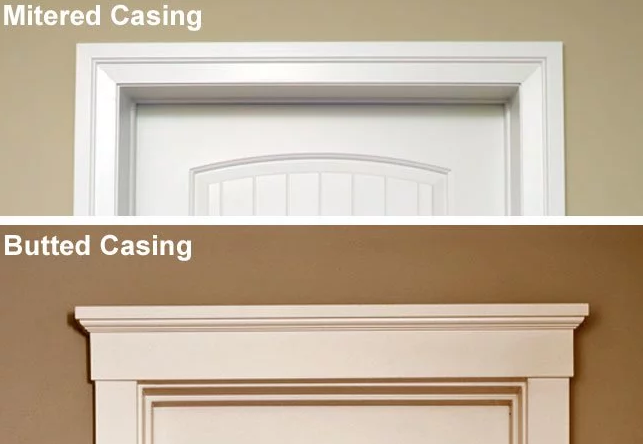 To better understand the type of door casings that might be best for your home, it helps to know the difference between mitered and butted door casings. Mitered casings connect the three basic parts—side pieces and header casing—using angled (mitered) joints. Mitered casings can be simple and flat or more elaborate, including wider options that contain intricate details. Butted casings combine two side casing boards with a wider head casing that rests directly on top. The wide head casing tends to draw the eye upward, making this style a great choice for homes with high ceilings. This effect can be further enhanced by using intricate patterns or details in the head casing. “Whether you choose mitered or butted casing, you can choose to dress up the three main pieces of trim by integrating two decorative blocks (called rosettes) in the top corners,” a recent article on BobVila.com points out. 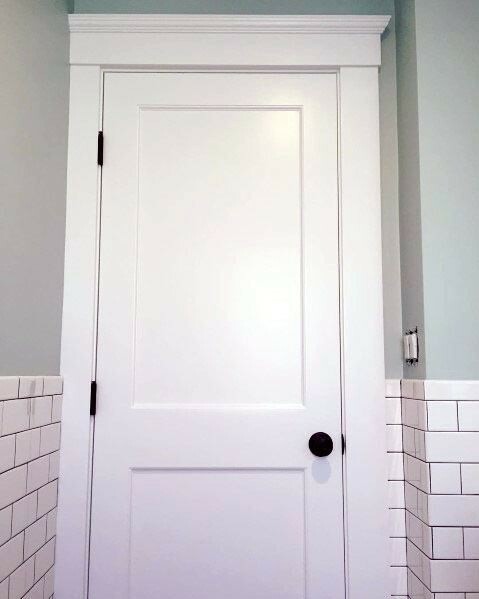 Found in many homes throughout the United States, this basic Colonial-style door casing features raised edges and mitered corners. Built from the inside of the door jamb outward, this door casing features mitered corners and combines several layers of varying sizes to achieve a complex, yet attractive design that would feel right at home in any 19th century Victorian-era home or new Colonial Revival. Here’s an example of a butted door casing that combines flat side casings with a well-defined header casing and crown. Need more inspiration? Check out our site for a wide range of door casing profiles or visit one of our showroom locations to see up-close examples. 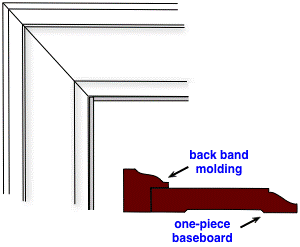 While door casings add architectural interest, StyleBluePrint.com warns, “balance is essential for aesthetic success.” In other words, it’s important to choose door casings that closely match or complement your existing base moulding, window casings, crown moulding, etc. Unless you are planning to change all of the trim throughout a particular room, it’s best to take design cues from what you already have. For example, if your baseboards and window trim are flat and mitered, your door casings should follow suit. Also be sure to match the thickness of the case moulding you’re considering to the casing around windows or other doors in the room. Some architectural styles create an air of formality that calls for more intricately designed trim options. Victorian homes, for example, are renowned for their intricate woodwork, soaring ceilings, and elegant crown moulding. Ranch-style homes, on the other hand, tend to be much less formal, making use of simple trim lines that create a casual look and feel. Let the style of your home on the outside dictate trim options on the inside to create a cohesive look. If you intend to replace all of the moulding in a particular room, feel free to get a little creative with your moulding choices. Make notes on styles you like and bring home samples to get a sense of how they might work in your space. You might also explore using some of the existing moulding profiles, but choose a different material or color scheme to put your own spin on it. For example, change out plain white door casings with solid wood options in your choice of stain. Rather than wandering through a home improvement store or lumber yard in search of matching case moulding, visit a moulding specialist like The Moulding Company, based in the San Francisco Bay area. Visiting a moulding showroom where you can talk with knowledgeable experts will give you the opportunity to ask questions and even get samples to take home. There’s no doubt that there’s plenty of choices when it comes to adding door casings to your home. But understanding door casing terminology and using your existing moulding as a reference should give you a great starting point to begin your search for just the right door casings for your home. Whether you’re looking for unique moulding options or want affordable moulding for every room in your house, The Moulding Company offers a huge selection of in-stock trim, moulding, baseboards, crown moulding, window casings and much more. Homeowners throughout northern California and the San Francisco Bay area get FREE delivery on all orders over $250. Should My Trim Be Light Or Dark?